Government of Biafra commences Worldwide Recruitment of International Diplomats. Biafran Govt seeks Ambassadors , Consuls and Attaches ; for Global Diplomatic Jobs and Consular Work.
. . . etc . . .
All Successful Ambassadors , Consuls and Attaches will be awarded Full Biafran Diplomatic Status ; in addition to a Biafran Heritage Number and a (Permanent) Biafran National Honour which is Deemed to be Appropriate for their Respective Diplomatic Grade. Prospective Applicants Must Apply via the Official Biafran Government Website ( http://www.govt.africa ) ; as soon as possible. In (Rare) Cases of a Serious Recruitment Deadlock , (where there are Multiple Contenders of Equal Merit within a Particular Shortlist) ; then those who have Previously Supported the Smooth Functioning of Biafran Government Affairs , via Regular Financial Subscriptions or other Voluntary Activities , will Be Ethically Awarded an Extra Compensatory Point. All Diplomatic Appointments will be Formally Made at the Sole Discretion of the Government of Biafra. It is Provisionally Hoped that the First Batch of Biafran Diplomats will (firmly) be in place within the Next Few Weeks (or so) ; and that their Relevant Diplomatic Insignia should (promptly) arrive thereafter. There is No Official Closing Date for Nominations (or Appointments) : However , Most of the Top Diplomatic Posts often do tend to get filled (quite) quickly. Please Do Not Apply for Any of the Aforementioned Biafran Diplomatic Posts if you have an Overwhelming Public Interest in Partisan Biafran Politics. As Far as the Government of Biafra is concerned : The State Counsellor , together with All Ambassadors , All Consuls and All Attaches are ALL Explicitly (and Implicitly) Forbidden to Actively Engage in Any Public Form of Partisan Biafran Political Activity (Whatsoever). Potentially Unsuitable (Partisan Political) Applicants for Biafran Diplomatic Appointments are hereby Warmly Encouraged to Ultimately Contest for Biafran Senatorship instead ; most preferably after being Formally Adopted via Any of the Available Electoral Platforms of either the BPP , the NPB or the PBA. The Largest (Senatorial) Party (or Coalition of Senatorial Parties) in the Unicameral Legislative Congress (of Biafra) usually appoints the Presiding Officer of the Biafran Parliament (which is primarily of Joint Equivalence to the Combined Posts of Senate President and Speaker - All in One). It will (Furthermore) be Up To the Leadership of the Aforementioned Biafran Political Parties , (i.e : the BPP , the NPB and the PBA) , to also decide if they wish to Additionally (and Statutorily) Register themselves with the Appropriate Election Authorities in Nigeria , Cameroon , UK , Ireland , Canada , USA , Ghana , Equatorial Guinea , South Africa , Gambia , Botswana , Burma (Myanmar) or any other Countries Elsewhere (etc) ; for the purposes of Lawfully Contesting during Relevant Elections within those Particular Countries in Question. Among Other Modest Privileges , All Biafran Senators will be Duly Entitled to a Biafran Heritage Number ; and a (Permanent) Biafran National Honour which is Deemed to be Appropriate for their Respective Senatorial Grade. 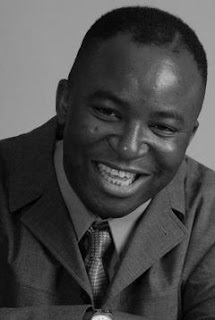 Professor Doctor Joseph Chikelue Obi is a Highly Controversial Black European Politician of British Birth , Biafran Heritage , Igbo Extraction , Nigerian Wit , African Descent , Global Outlook , International Renown and Worldwide Reach. Doctor Obi previously worked as a (Young) Medical Adviser at State House Annex Clinic in Abuja ; around the time of the Equally Controversial Presidency of General Ibrahim Badamasi Babangida. For the Past 20 Years (or so), he has quietly served as State Counsellor to the Biafran Diaspora ; a role which has taken him Substantially Across the Globe. https://www.linkedin.com/in/alternativemedicinedoctor is the Official Linkedin Profile of Prof Obi. 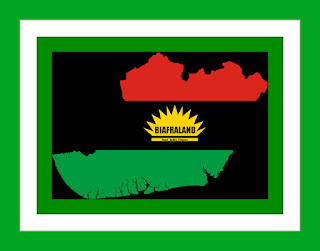 * To Peacefully Apply for Diplomatic Recognition of Biafraland ; as an Independent State under Lawful Occupation. * To Peacefully Represent the Biafran Diaspora at the United Nations (UN) , the European Union (EU) and All Major Diplomatic Bodies across the World (and Beyond). * To Peacefully (and Jointly) Negotiate with (both) Nigeria and Cameroon ; on an Ongoing (Harmonious) Level. * To Peacefully Conduct a Census of All (Non-Terrorist) Biafrans in Diaspora. * To Internationally Promote Biafrans as a Peaceful (Non-Terrorist) Human Race. www.govt.africa is the Official Website of the Government in Diaspora ; of Biafraland. Effective the 21st Day of September 2017 (when He was Officially Sworn in) , the State Counsellor has since automatically assumed the Official Diplomatic Status of an Internationally Protected Person (IPP) ; as duly outlined by the relevant United Nations (UN) Conventions and Other Appropriate Diplomatic Treaties. * A Head of State, including any member of a Collegial Body performing the functions of a Head of State under the constitution of the State concerned ; as well as members of His (or Her) Family who accompany Him (or Her). * A Head of Government ; as well as members of His (or Her) Family who accompany Him (or Her). * A Minister for Foreign Affairs, whenever any such person is in a Foreign State ; as well as members of His (or Her) Family who accompany Him (or Her). * Any Diplomat or Representative or Official of a State , or Any Official or Other Agent of an International Organization of an Intergovernmental Character who , is entitled (pursuant to International Law) to Special Protection from any attack on His (or Her) Person, Freedom or Dignity ; as well as members of His (or Her) Family forming part of His (or Her) Household. * While The United Nations (UN) globally sets the Criteria for "Internationally Protected Persons", it is Solely up to the Relevant Governments (Themselves) to decide who Individually Qualifies for the Appropriate Positions which the UN has carefully set out in it's Aforementioned Diplomatic Criteria (Inter Alia). Additional Information will be Formally Released in due course. We have been receiving Quite a Lot of Independent Enquiries about how we manage to (Sustainably) Support Ourselves ; since we never (ever) go about asking for Handouts. Financially Supporting Us , via Regular (Weekly) Subscriptions , can now easily be done with Any Credit Card , Any Debit Card ; or Any USA Bank Account - Without Any Fundraisers or Agents , or Middlemen. Simply Select the Most Appropriate Subscription Button (below) ; and Payments will be Deducted Automatically , on a Weekly Basis. Subscribers Can Make Any Number of Subscriptions , Any Number of Times (as far as Different Cards and Bank Accounts are used). Subscribers are also Totally Free to Stop their Subscriptions at Any Time. We would prefer to have just a Few (Dedicated) Lifetime Subscribers , rather than (Many) Thousands of Irregular Ones. A Public List of Lifetime Subscribers will Be Published on this Page , together with a Direct Link to their various Social Media Profiles. Lifetime Subscribers also get Free Press Releases for Births , Deaths , Marriages , Anniversaries , Birthdays , Graduations , Retirements and other Public Announcements. Lifetime Subscribers are Additionally Entitled to a Wide Range of Other (Discretionary) Benefits , which are Not Openly Mentioned on this Page. All Lifetime Subscribers have Direct Access to the State Counsellor ; and can Periodically Ask for Special Assistance or Discretionary Consideration - as far as Such Requests do not Unlawfully Infringe on the Fundamental Rights (and Freedoms) of others. Finally , Please Remember that I can always be Personally Contacted by Clicking on any of the Images Below. Unlike Some Other Biafran Governments (Out There) - This particular Government of Biafra of ours , (which is currently led by the State Counsellor of Biafra Land) , will Never Ever Compel Anyone to Financially Support it's Biafran Govt Work. Those Who Cannot Afford to Make Regular Monetary (Govt of Biafra) Subscriptions are therefore Very (Very) Welcome to Fervently (and Frequently) Pray For Us (instead). As Far as the Biafraland Government is concerned : Regular Daily Prayers are Not Less Valuable than Regular Weekly Cash. The Government in Diaspora is (Very) Different from other Biafran Governments , in that we do not have a Codified (Single , Written) Constitution. Like the United Kingdom , which also has an Uncodified ("Unwritten") Constitution , our Defining Statute is fundamentally based on Precedent and other Pieces (etc). Thankfully , to Judiciously Prevent a State of Utter Statutory Chaos , we proudly have one of the World's Most Tolerant Bill of Rights. Unlike many other Biafran (Government) Charters , Biafraland (Gov) Bills and Biafra (Govt) Conventions , the Biafran Bill of Rights is Liberal , Dynamic and Eclectic ; rather than Conservative , Static and Regimented. Biafra and the Nigerian Constitutional Crisis : State Counsellor of Biafraland - Your Questions Answered (International Fact File). Please Be Advised that this is an Exceedingly Brief Summary of Governmental Affairs , Strictly for Purposes of Literary Simplicity. * While The United Nations (UN) globally sets the Criteria for "Internationally Protected Persons" , it is Solely up to the Relevant Governments (Themselves) to decide who Individually Qualifies for the Appropriate Positions which the UN has carefully set out in it's Aforementioned Diplomatic Criteria (Inter Alia). The Biafran (Pound) Equivalent of Standard International Per Diem Rates ; as published by the Office of Allowances (of the American Department of State). The State Counsellor of the Government in Diaspora (of Biafraland) is the Chief Public Servant of the Government in Diaspora ; and the Top International Diplomat of the (Worldwide) Biafran Race. The post was created in 2017 by the Biafran Diaspora , to effectively facilitate International Diplomatic Work across all areas of Government. It is Totally Different from the Role of State Counsellor to the Biafran Diaspora , which was established in 1997 as a Non-Governmental (Qasi-Consular) Role. By Convention , the State Counsellor of Biafraland is formally addressed as 'The Most Excellent State Counsellor' rather than 'His (or Her) Excellency , The State Counsellor'. The Electorate in Diaspora ; via the Independent Peace Commission (of Biafraland). It is alleged that there may currently be over 30 (Thirty) Million Biafrans in Diaspora (WORLDWIDE). There are Type 'A' Biafrans (Historically Under Only Nigerian Jurisdiction) who were Dispersed during the Nigerian Civil War and other Events. There are also Type 'B' Biafrans (Historically Under Only Cameroonian Jurisdiction) who were Dispersed during the (Various) Battles of Bakassi and other Events. Furthermore , It must be duly noted that there are Type 'C' Biafrans who are Neither Type 'A' or Type 'B'. Most of those in Type 'C' are Honorary Biafrans. The State Counsellor of Biafraland is not permitted to Discriminate between (either) Type 'A' Biafrans , or Type 'B' Biafrans or Type 'C' Biafrans. All Biafrans are Treated Equally. Each Biafran has One (Electoral) Vote. Independent Peace Commission (made up of Legislators, Jurists , Elders , Observers and Hired Experts). The Independent Peace Commission supervises the State Counsellor of Biafraland ; and has the Absolute Power to Call for His (or Her) Resignation via Unanimous Vote. The State Counsellor of Biafraland cannot resign from office without the Unanimous Approval of the Independent Peace Commission. The State Counsellor of Biafraland is not the President of the Independent Peace Commission ; and has nothing to do with it's Daily Affairs. The Independent Peace Commission supervises the State Counsellor of Biafraland ; and has the Absolute Power to Impeach Him (or Her) via Unanimous Vote. Founding Fathers and Founding Mothers (of the Biafran Diaspora) are nominated by the Electorate in Diaspora ; via the Independent Peace Commission (of Biafraland). Founding Fathers and Founding Mothers (of the Biafran Diaspora) are not Presidents of the Independent Peace Commission ; and have nothing to do with it's Daily Affairs. The Independent Peace Commission ratifies Founding Fathers and Founding Mothers (of the Biafran Diaspora) ; and also has the Absolute Power to Impeach Them via Unanimous Vote. Founding Fathers and Founding Mothers (of the Biafran Diaspora) cannot resign from office without the Unanimous Approval of the Independent Peace Commission. The Independent Peace Commission strictly regulates Founding Fathers (of the Biafran Diaspora) ; and furthermore has the Absolute Power to Call for Their Resignation via Unanimous Vote. Only One , So Far. Professor Doctor Joseph Chikelue Obi - a Highly Controversial Black European Politician of British Birth , Biafran Heritage , Igbo Extraction and African Descent - currently serves as The Most Excellent State Counsellor ; who is the Chief Public Servant of the Government in Diaspora and the Top International Diplomat of the (Worldwide) Biafran Race. For the Past 20 Years (or so), he has quietly served as State Counsellor to the Biafran Diaspora ; which was established in 1997 as a Non-Governmental (Qasi-Consular) Role. The Independent Peace Commission supervises all National Honours relating to Biafraland ; and has the Absolute Power to withdraw Any Such Honours via Unanimous Vote. By Convention , State Counsellors of the Government in Diaspora (of Biafraland) and their Partners (or Spouses) are automatically entitled to use either GKB or GDB. By Convention , the Heads of State (of the Biafran Diaspora) and their Partners (or Spouses) are automatically entitled to use either GKB or GDB. By Convention , Founding Fathers and Founding Mothers (of the Biafran Diaspora) and their Partners (or Spouses) are automatically entitled to use either GKB or GDB. This is the Unique Official (Photo ID) Document which carries a Biafran Heritage Number or BHN. It is Valid for a Period of 10 (Ten Years) ; and can also be replaced in event of loss. In addition to a BHN , Each Biafran Heritage Document also has a Document Verification Code. This is the Official File Number which appears on a Biafran Heritage Document. It Never Changes , throughout Life (or After Death). Each Biafran has a Unique BHN. This is the Official Genealogical Database of Biafrans in Diaspora ; and their Traceable Ancestors. Biafra , the Republic of Biafra or the Biafran Free State are (Officially Recognized) Terms (and Titles) - which all equally refer to the Innate National Identity of the Disputed Territory of Biafraland ; in the Eastern Part of West Africa , the Western Part of Central Africa , together with a (Remarkably) Substantial (Cultural) Potpourri of Various Other (Highly Contentious) Little Bits and Pieces of the (Worldwide) African Diaspora. Contrary to (Numerous) Highly Misconstrued Reports , the Grassroots Government of Biafra has always been Peacefully Functioning in one particular form or another , (ab initio) without interregnum ; irrespective of whether Biafra previously Existed as a Separate Sovereign Entity in it's Very Own Right , or Not. Biafra is therefore still (Very Much) Alive and Well : It is (Most Certainly) Not an Unrecognized (or Failed) Identity (Let Alone a Dead One). About The State Counsellor of Biafra Land and His Basic Remit. * * * Please Be Advised that this is an Exceedingly Brief Summary of Governmental Affairs , Strictly for Purposes of Literary Simplicity.Effective the 21st Day of September 2017 (when He was Officially Sworn in) , the State Counsellor has since automatically assumed the Official Diplomatic Status of an Internationally Protected Person (IPP) ; as duly outlined by the relevant United Nations (UN) Conventions and Other Appropriate Diplomatic Treaties. About The State Counsellor | About The Government of Biafra | Basic Information | Govt Functions. Click Here To Publicly Support The Very Wide Range Of International Work Which We Are Doing. Telemedicine | Consultations via Phone | Consultations via SMS (Text) | Consultations via Internet. Smart Medical Apps | Clinical Advice | Learning | Mentoring | Assisting | Supporting | Self Help. Health Updates | Self Care | Online Health Advice | Free Health Tips | Training Courses | eBooks. State Counsellor News | Testimony 1 | What The Bishop Saw. 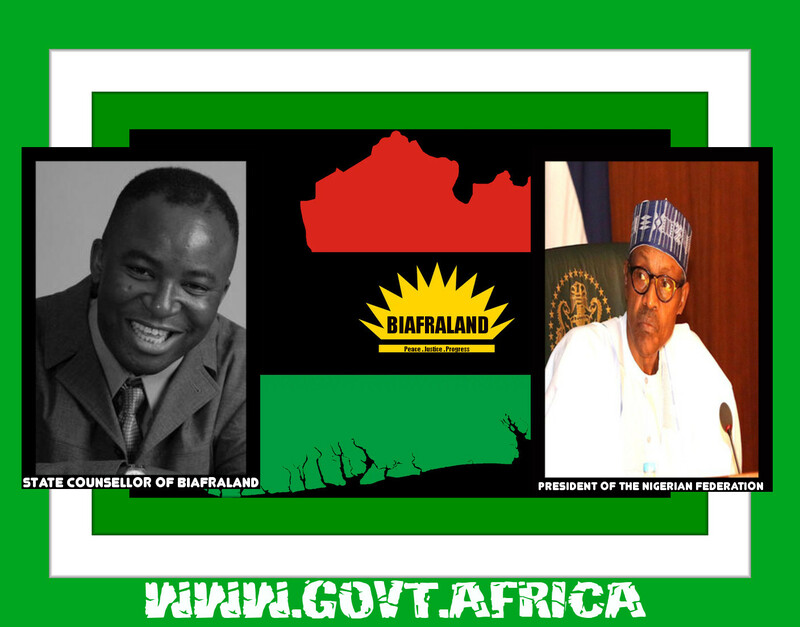 Biafra Government | Biafran Bill of Rights | Govt of Biafraland. Government of Biafra | Simple Summary | Govt of Biafra Land. Diaspora Government | 2017 Honours List | Dame Nelly Uchendu GDB | The First Lady of (Igbo) Highlife , Rhythm & Blues. Click Here To Publicly Support The Work Which We Are Doing. * A Special Medical License , directly issued by the Government of Biafra , which has competently been held for an Aggregate Period of Not Less than 12 Consecutive Months. * An Examination Score of at least 70% (Seventy Percent) in the MLC Entrance Examination (MLCEE). * A Certificate of Completion of Training from the Director of the MLC Telemedicine Programme. Biafra , the Republic of Biafra or the Biafran Free State are (Officially Recognized) Terms (and Titles) - which all equally refer to the Innate National Identity of the Disputed Territory of Biafraland ; in the Eastern Part of West Africa. State Counsellor of Biafra Land - Chief Public Servant & Top Government Envoy.